First of all, I want to tell you I am writing this post on Friday evening, as I will be away for a weekend, and I am scheduling it to be released on Sunday. So if something new and important happens between today and Sunday, I'll either update my post, or mention it in the next one. Pretty interesting week, though, in my opinion. Let's see what happened this week. 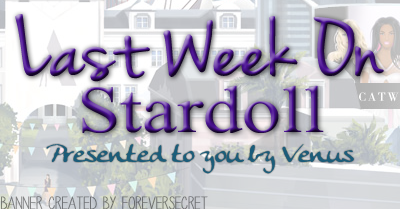 On Monday, Stardoll released an exclusive Superstar/Royalty only store, named JetSet. The idea seemed nice, but I was hoping for some sort of update, not just 'an ordinary' store. It is true that some pieces are gorgeous, but not a big deal as announced. My absolute favorite is green cut out dress, which I plan on buying next time I renew my ss membership. There are some other nice items, there is also an exclusive furniture. But again, nothing special. This release, however, made me really, really happy - I am talking, of course, about 2 new floors of Ink'd tattoo store. This collection is inspired by Japanese letters and motives, we have dragons, pandas, cherry blossom motives, etc. Really cute motives, and I know many are excited for those letters. Not me, I am not a huge fan of that motive, either in real life or Stardoll. And I am huge fan of tattoos. The reasons I haven't bought anything yet is that the items I love the most are ss only ;( But I'll get them eventually. I really love that Stardoll listened to their users and decided to go on with designing tattoos for our dolls. It seemed like a good investment and people are liking them, because otherwise we wouldn't be getting 3rd collection, right? 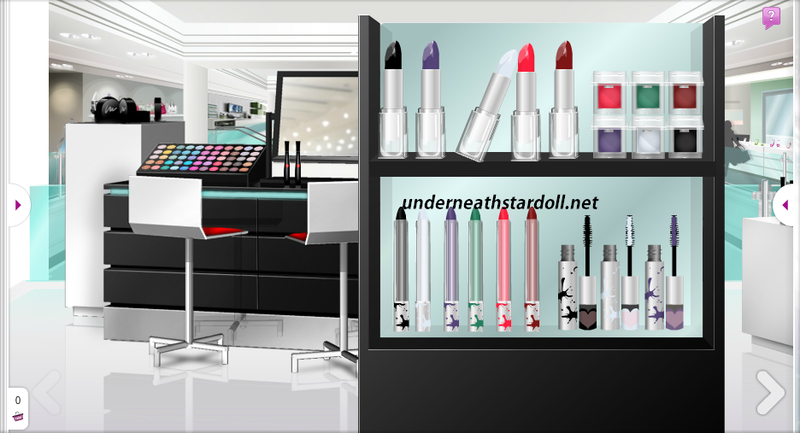 On Friday, Stardoll released a new make-up store. Halloween themed. - More 'new' make up, which is actually just a bit darker or lighter from ones we already have. Still, I am sure users can create a nice Halloween themed looks, and then use this make up with some 'ordinary' when the holiday is over. And the same day, finally a 50% off sale - unfortunately, only on Nelly.com Cheap Monday collection. Of course I am happy about the sale. I, however, have most pieces I like already, so it is no such a big deal to me.And even I keep saying we need more sales, I don't like sales too much. I mean, they make us thinking we are saving up by paying less for stuff, when exactly we are spending more stardollars than we usually would. The collection is beautiful, so after finishing this post, I'll be heading over to the store and buy what I want before it is too late. Great opportunity for you, readers, fantastic store going on half price sale, it is something you don't wanna miss. Like I said, I loved this week. Halloween is coming soon, and even my country does not celebrate it, people who run Stardoll probably do, or just release holiday themed stuff for ones who actually celebrate it. So I am really looking forward to seeing some new, dark themed outfits. Just please no re-releases. Well actually, there is some stuff I'd want back, but still. Ok, to cut it short, you know what to do, and see you next week.